Early start and pick up Dave Motley to get down to Edale for around 8:00 am. Some bad omens as we get lost driving down or were we just half asleep? All's well as we get registered and start for about 9:00, Dave probably going 10 minutes before me. 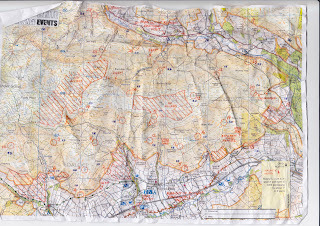 Dib, get my map and set off planning as I jogged up the lane towards Edale village. I've only been here once before so it's a little understandable when I run into the car park of some sort of outdoor centre; looked a bit of an idiot but never mind. Run back out on to the lane. I had looked at the map carefully before hand so I had an idea of the way I'd do this checkpoints. One bunch to the west seem to be better to bag at the end if time allows as they're slightly isolated. I'd go anti clockwise right round towards the back of Kinder near the A66 and then come back and decide which to pick up towards the end. All went well with just a few problems and slower legs. 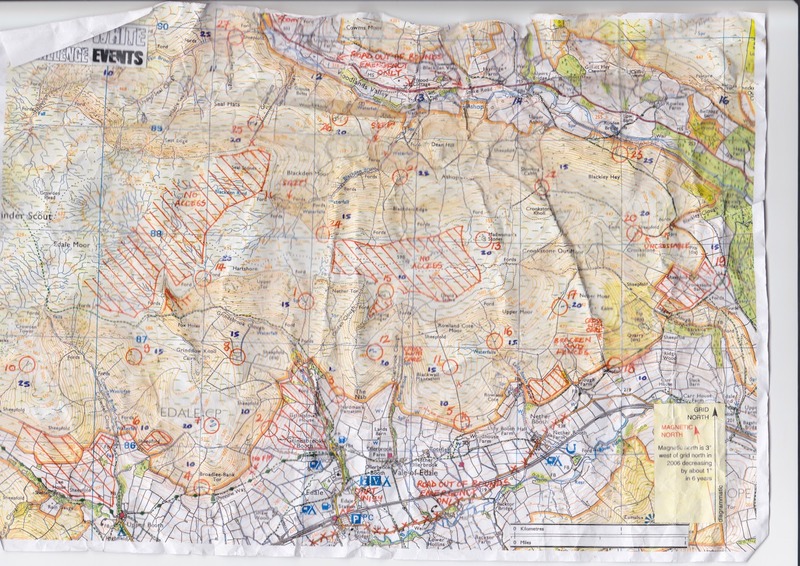 I did find it difficult to maintain map to ground contact at times when I was crossing very rough ground and the absence of any local knowledge beyond one Skyline rec was both difficult and more exciting. My biggest mistake was after over 3 hours by choosing to go west steadily traversing up toward the edge to the north of Grindsbook Clough instead of climbing up on to the edge and just running along it. Although it lost me little time it was so difficult under foot and so tiring I didn't plan my next leg properly and that cost me a few minutes. It also meant that my finish had to be absolutely flat out, descending 1100" and running like a lunatic through the village to not go over 4 hours and 5 minutes and start incurring double penalties. I made it by 5 seconds. Dave appeared and asked if I'd moved the keys hidden on the car tyre, not very secretively. No I hadn't but they'll turn up, I thought! Once I'd downloaded I realised I was in the lead, at the time! This didn't cheer Dave up, he's a bit selfish sometimes! Anyway after he got a lift up to Lancashire got my keys and came back and I'd stood around for 4 hours trying to keep warm we did get into the car. The wife was very unimpressed with having to drive the keys part way down! Final result was that I came 4th and 1st vet 40. I presume I've taken the series V40 title with 2 class wins. I think that gets me into the Rab MM 2 day event for free next year. Might have to take this seriously!